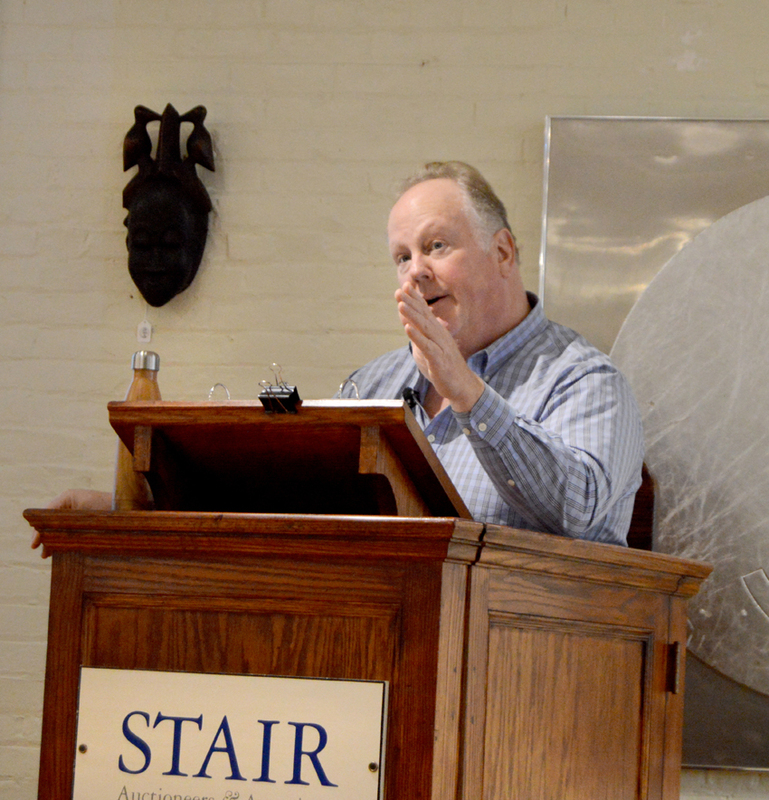 Colin Stair calls for bids during the jewelry session, which kicked off Friday’s auction. HUDSON, N.Y. — The top lot of Stair Galleries December 4–5 two-session auction was not surprisingly a choice example of Twentieth Century artwork, which continues to lead the art world of late. Midway through Saturday’s session came “Time Step,” an oil on aluminum with wood by Yaacov Agam (b 1928) that handily outperformed its $20/40,000 estimate to attain $91,050. 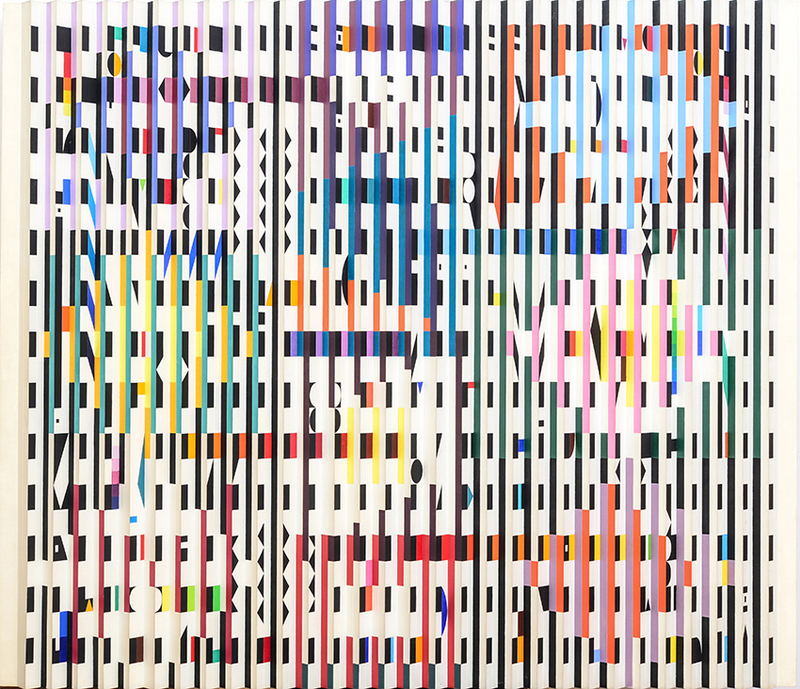 The painting’s owners commissioned Agam to make this work in 1971 and it is among the artist’s “metapolymorphic” works, meaning that is has the ability to exist in more than one way for the viewer. This philosophical approach to creating art was borne from Agam’s religious upbringing and is central to his work, which succeeded in moving beyond the constraints of traditional two- or three-dimensional art. 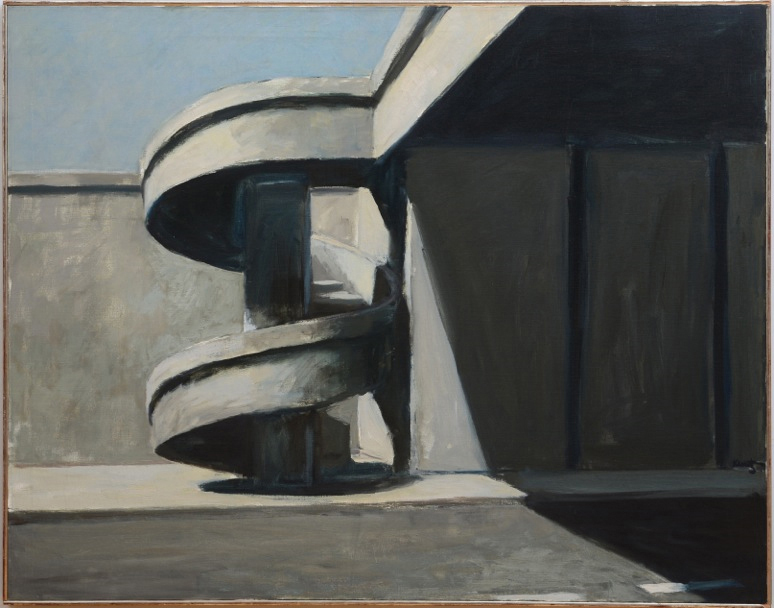 Another paintings standout was Roger Kuntz’s (1926–1975) “Pedestrian Spiral,” a circa 1965 oil on canvas representative of his renowned “Freeway” series. It brought $36,000. “We were thrilled with the price realized for the Roger Kuntz painting. It will be returning to California where it will be at home with other important Kuntz works. We achieved a strong price for an artist whose work merits wider attention in the marketplace,” said Lisa Thomas, Stair Galleries’ director of fine arts department. The top lot of the auction was “Time Step” by Yaacov Agam that made $91,050. This signed painting has a label on the reverse indicating that it won first prize at the 1965 L.A. Home Show. A member of the Claremont Group, Kuntz was a figurative artist who transformed his subjects — domestic scenes, figures and freeways — into almost abstract forms. Rounding out the art offerings was Esteban Vicente’s “#4 Collage,” which went out at $24,000. Another standout among art was Roger Kuntz’s “Pedestrian Spiral” at $36,000. Friday’s session kicked off with jewelry, led by a retro gold and diamond ring offered with a pair of pins that sold for $26,400 and an unusual Bulgari gold and enamel elephant bangle in gold and enamel, having diamond eyes, that made $20,400. Muffie Cunningham, Stair’s director of decorative arts department, noted during preview that the subject matter as well as the enamel work was unusual. “The interesting thing about this particular bracelet is that is an elephant as opposed to a panther,” she said. Auction favorite Warton Esherick was represented in this sale with a fine example of his library steps in walnut that earned $30,000 and a coffee table that brought $25,200. Hudson’s Winter Walk took place the same weekend of the auction. 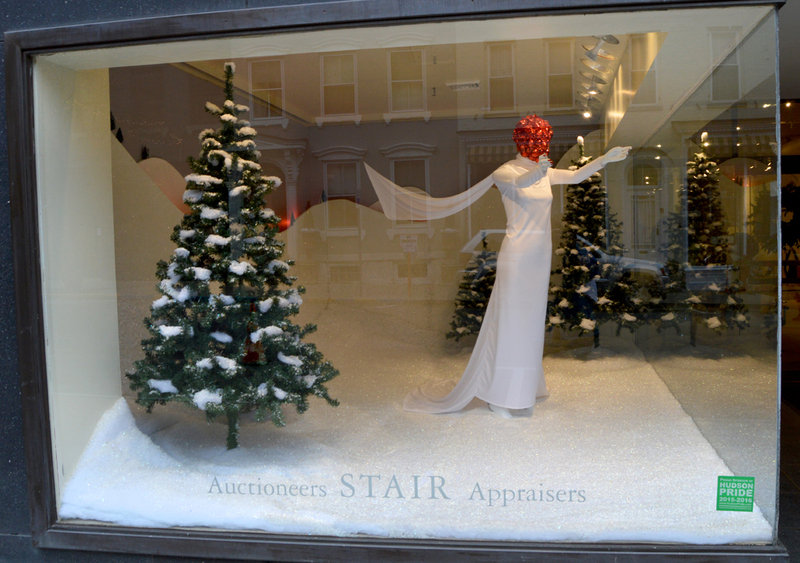 Shops, restaurants and galleries downtown decorated their windows for the holidays. All prices reported include a the buyer’s premium. Stair Galleries is at 549 Warren Street. For additional information www.stairgalleries.com or 518-751-1000.